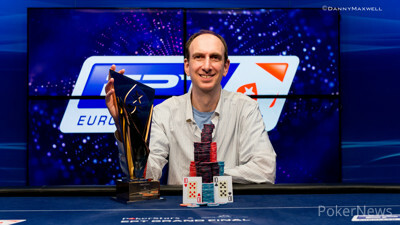 Erik Seidel Wins 2015 EPT Grand Final €100,000 Super High Roller for €2,015,000! From a man who entered this event with nearly $22 million in career tournament cashes, the admission that this was "one of the best tournaments of my career" make a strong statement. That's what Erik Seidel called his win in the 2015 PokerStars and Monte-Carlo® Casino EPT Grand Final €100,000 Super High Roller. Seidel topped a field of 71 entries to add €2,015,000 to his coffers, making him jump from fifth till third on the poker's all-time money list, surpassing Phil Ivey and Daniel Colman. "I've knocked on the door a few times here," he said. "It was a surprise to me because I was low on chips all day." Indeed, Seidel spent much of the day near the bottom of the counts and entered heads-up play at a 3-1 deficit to fast-rising Polish star Dzmitry Urbanovich. However, he managed to grind his way to victory over the course of a lengthy four-hour match that saw him slowly but surely turn the tide. He eventually worked to put Urbanovich away without letting the lead slip from his hands once he grabbed it. The final day of the tournament began with the official final table of eight players, featuring some of the usual high-stakes stars like Igor Kurganov, Max Altergott, and Scott Seiver. Seiver came in as the short stack with just about 12 big blinds and found himself out the door in short order. German World Championship of Online Poker champ Fedor Holz was next to go, shoving for 15 big blinds over a button open from Kurganov. Kurganov put him at risk with the , and the board cut the tournament down to six. Two hands was all it took for Thomas Muehloecker to follow Holz out the door in sixth place. He found a good spot, calling off his last eight big blinds from the big blind with the when Urbanovich shipped with the from the small blind. 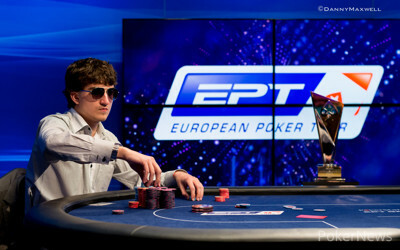 The star of EPT Malta flopped a three and managed to hold up as Muehloecker bricked out. Then, Urbanovich ascended to the top when he flopped trip fours with the and took a heap from Kurganov, who was in the lead at the time, and it looked like everyone else might be playing for second because Urbanovich then held half of the chips in play five-handed. Kurganov's fall was completed a bit later when he lost a race to Urbanovich for the rest of his stack and busted in fifth place. Urbanovich's hot run continued when he cracked Dario Sammartino's with the as the board came , giving Urbanovich a backdoor flush. Two hands later, Altergott, who grinded a short stack the whole day, sent his chips to Seidel. After the dinner break, the heads-up match began, and Seidel couldn't do much but tread water for the first hour. However, he stayed patient and found a double when Urbanovich shoved the button with the and Seidel woke up with the . The eight-time World Series of Poker gold bracelet winner called off his 12.5-big blind stack and doubled up. He took the lead shortly after when he made a flush with the against the on a board and got paid off for 1.6 million on the river. From there, Seidel didn't let up and chipped away for the next two hours until Urbanovich limp-shoved for just over 5 million (17 big blinds) with the . Seidel had a dominating , and the board of meant Seidel had his win. "It feels so good just to get the win," he said afterwards. "I'm just thrilled." Hand #227: Urbanovich limped in from the button with , like he had done many times before. Seidel raised it up from the big blind to 900,000, like he had done before. This time though, Seidel had a really big hand with the . While the commentators thought Urbanovich might limp-call, it was in fact a shove that followed. The young Polish player shoved for 5,060,000, and Seidel instantly called. The flop came , not doing really anything. After the on the turn, Urbanovich was down to just 3 outs. 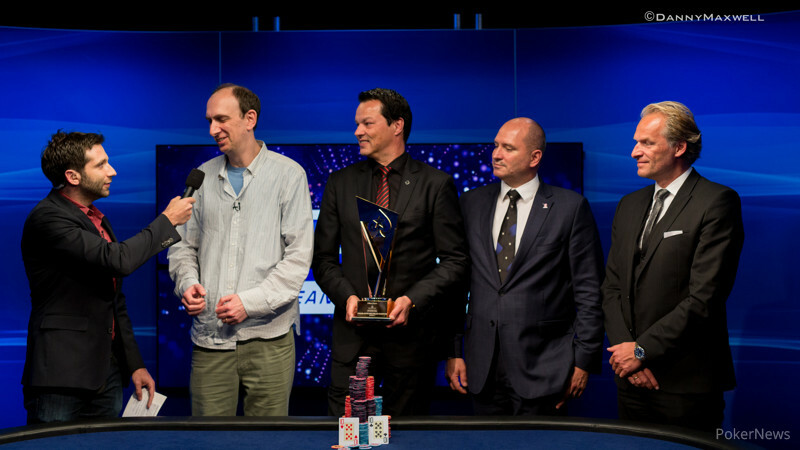 The on the river was a blank and just like that, Erik Seidel was crowned the champion while Urbanovich had to do with seconds. That second place was still good for €1,446,000 though, catapulting Urbanovich to the top of the Polish all time money list, surpassing Dominik Panka and Marcin Horecki. Hand #224: Seidel raised to 300,000 from the button with , Urbanovich called with . The flop came and made Urbanovich check, and call Seidel's 300,000 bet with his six-high, which was in fact the best hand. The on the turn made Urbanovich bet out 425,000 into 1,280,000 and Seidel folded. Best hand won. Hand #225: Urbanovich limped in with and Seidel checked his . The flop came and Seidel checked. Urbanovich bet 300,000 and Seidel immediately folded. Hand #226: Seidel raised it up to 600,000 with , Urbanovich folded. Hand #218: Erik Seidel called with the , and Dzmitry Urbanovich said he was all in for just over 4 million with . Seidel folded. Hand #219: Urbanovich called with , and Seidel made it 900,000 with . Urbanovich shoved, and Seidel folded. Hand #220: Urbanovich got a walk. Hand #221: Seidel got the walk. Hand #222: The two saw the for the minimum, and Urbanovich hit a with , the three-outer he needed against Seidel's . Seidel folded to a bet. Hand #223: Urbanovich limped . Seidel shoved , and Urbanovich folded. Hand #214: Seidel made it 600,000 with . Urbanovich had on the big blind and pushed all in for almost 5.5 million. Seidel folded. Hand #215: Urbanovich raised it up to 600,000 with and Seidel made the call with the . The flop came and had something for the both of them. Seidel checked, Urbanovich checked behind. The hit the turn and Seidel with his two pair bet 500,000 into 1,280,000. Urbanovich called rather quickly. on the river and Seidel bet a million. Urbanovich tanked for quite some time, but folded eventually. Hand #216: With on the button, Seidel limped in. Urbanovich shoved all in with and Seidel instantly folded. Hand #217: Urbanovich limped in with , Seidel checked his option with . The flop came and both players checked. The on the turn gave Seidel a flush draw and he check called Urbanovich's 300,000 bet. Urbanovich, with a live flush draw of his own, saw the hit the river. Seidel checked and Urbanovich bet 525,000 into 1,280,000. Seidel sighed, folded his arms, leaned back in his chair, and tanked some more. After 3 minutes, Seidel called with the jack-high and took it down. Hand #209: Erik Seidel check-folded on a flop that the two players saw for the minimum. Hand #210: Seidel limped , and Dzmitry Urbanovich checked his . The board was on the turn after two flop checks, and Urbanovich bet 325,000. Seidel quickly called, and Urbanovich hit the nut flush with a river. He bet 675,000, and Seidel paid it off. Hand #211: Urbanovich limped , and Seidel shipped with . Urbanovich quickly folded. Hand #212: Seidel called with , and Urbanovich continued the trend of minimum flops with . Both flopped top pair on , and Urbanovich check-called 300,000. Urbanovich check-called another 600,000 on the turn. Seidel hit his two pair on the river, and he bet 1.35 million. Urbanovich stacked enough chips to call and leaned back. He pursed his lips and stared at the ceiling before calling. Hand #213: Urbanovich called with , and Seidel checked . Seidel bet 350,000 on the board on fourth street, and Urbanovich min-raised an won the pot. Hand #202: Seidel opened his button to 480,000 with . Urbanovich with in the big blind wasn't interested and folded. Hand #203: Urbanovich with limped in, Seidel checked . Both players checked the flop. The on the turn made Seidel check, and call the 240,000 bet Urbanovich made. The on the river made Seidel check again. Urbanovich bet 325,000 and Seidel called. Urbanovich showed his top pair and was pushed the chips when Seidel mucked. Hand #204: We missed this hand unfortunately. Hand #205: Urbanovich had on the button and raised it up to 480,000. Seidel instantly folded. Hand #206: Seidel was first to act and made it 480,000 with . Urbanovich called with . The flop came and both players checked. The on the turn made Urbanovich check again, Seidel checked behind instantly. The river came the and Urbanovich bet 320,000. Seidel called and the two chopped it. Hand #207: Another big pair for Urbanovich on the button; , he made it 480,000. Seidel called with . The flop came and Seidel checked. Urbanovich bet 675,000 and Seidel folded. Hand #208: Seidel made it 480,000 with , Urbanovich called with . The flop came and both players checked. The hit the turn and again two checks. The on the river made Urbanovich check. Seidel bet 400,000 and Urbanovich called and took it down. Hand #197: Dzmitry Urbanovich shoved in with a and took the pot. Hand #198: Erik Seidel completed the blind with , and Urbanovich checked . The missed both, with Seidel only getting a gutshot, and both checked to the river as the and hit. More checks, and Urbanovich won. Hand #199: Urbanovich completed with , and Seidel checked . After a free turn, the board was , and Seidel bet 300,000. Urbanovich raised to 745,000, and Seidel called. On the river, both quickly checked, and Seidel took the pot with fours. Hand #200: The two saw a for the minimum, and Urbanovich check-called an unknown wager with . Seidel picked up a pair with as the hit the turn, and he checked back. Urbanovich had the better two pair on the river, and he bet 350,000. Seidel quickly called, and Urbanovich took the pot. Hand #201: Urbanovich called, and Seidel checked. Seidel won the pot on the turn.